Brides! Let's talk details. Is it important to you to have those editorial-type detail photos woven throughout your wedding gallery? To some it is, others not so much. Neither is right or wrong and it's completely a matter of personal preference! That being said, if those detail photos are important to you, there are a few things you can do to make sure your photographer is able to get all the the shots you want. First: make a list ahead of time of all of the details you'd like photos of (this can be as broad or as narrow as you want). Examples include the essentials, such as the rings, jewelry, his tie, watch, and both pairs of shoes, but can also include your flowers, any special pieces that may have been handed down by family members, and your invitation suite. Second: If you've determined that you would like photos of your invitation suite included in your gallery, be sure to save one set for your photographer. Ribbon by May Arts Ribbon//Invitations by Hey Tayler Design Co.
Third: Have all the important details of your day in one place at the time of your photographer's arrival. Also, along these lines, if these editorial-type, detail-specific shots are important to you, make sure you've requested your photographer to arrive early enough to get these photos before you have to put them on! 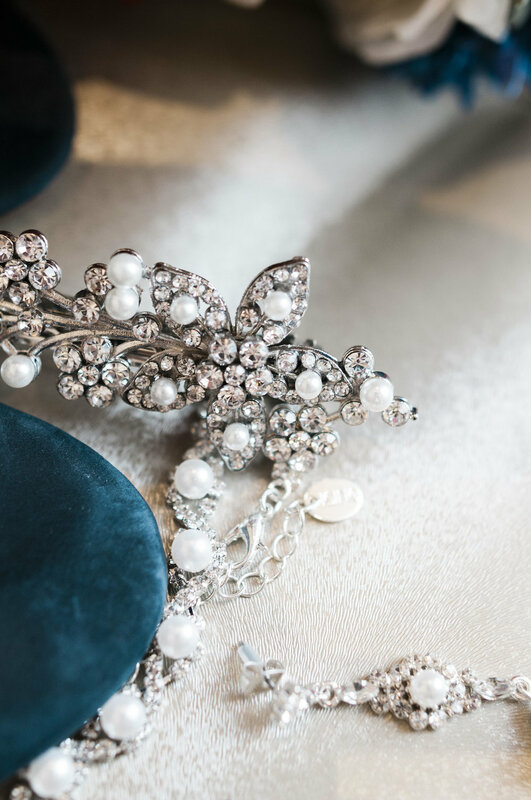 Fourth: If you want to showcase your bling against the gorgeous, velvety backdrop of your wedding colors, consider purchasing a ring box as part of your detail suite. The Mrs. Box makes beautiful boxes in a wide variety of colors and also offers three different monogram lettering styles to customize your box. Little touches like a ring box in your colors can add a curated, designed feel to your gallery. Ring box by The Mrs. Box//Ribbon by Tono & Co.
Fifth and finally: Communicate with your photographer! Let him/her know what items are important to you. Hopefully, you will have reviewed your photographer's portfolio prior to hiring him/her so you'll have an idea of how they capture these pieces within their own style and will be fully on board with their process, but if it's important to you to get something specific, just tell him/her - we want to provide you a photographic story of your day that will remind you of all the wonderful elements thereof AND one that you will cherish forever!